In the bathroom of a house on a remote and unspecified Scottish island somewhere north of Shetland, two women are trapped. The elder of the two, Margaret, has confined them there, locking the door and swallowing the key. The younger, Margaret’s daughter Ella, is desperate to get out; to check on her baby son sleeping next door, she says, although her mother knows Ella has plans to jump ship with the boat in the harbour for a dangerous mission of environmental activism. Off the back of his crackling, pacy direction of the Traverse’s Edinburgh Festival Fringe hit Ulster American, Gareth Nicholls once again shows an emphatic skill for capturing naturalistic pace and flow in the most unvarnished of dialogues. 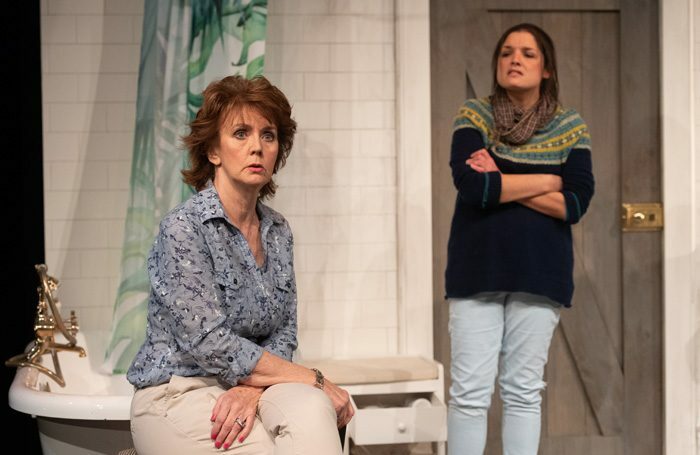 The set is simple, static and unchanging, the play modest in length, but in Clare Duffy’s delicately balanced script the concerns of generations about the shape of the world are wrung out. While there’s something slightly artificial about the peaks of tension being forced by the pair’s remote viewing of the mission to sabotage an arctic rig going wrong, their interplay is perfectly poised, and resonant in its refusal to take sides. Jennifer Black’s Margaret is by turns haughty in her dismissal of Ella’s heated environmental passion, but hurt by Ella’s refusal to see her belief that the most righteous thing her daughter can do is be a diligent mother. Meanwhile, Neshla Caplan’s Ella is a study in edgy dissatisfaction whose concern for the world might mask her own loneliness and insecurity. Neatly framed amid a murmuring, almost subliminally tense electronic soundtrack by Stephen Jones, this one-act study of generational conflict contains much to admire, but never feels overcrowded.